The seed for the farm was I believe planted by Harold Sayre, Dave’s father, who once farmed six hundred acres here and twenty five years ago welcomed his new neighbors from the city, emerging out of the cedar break between his house and mine announcing that no one had ever decided on which side of the property line the cedars grew but he thought they were mine. He helped me buy my tractor and told me dozens on dozens of stories, opening for me the world that proceeded the present. He and his father had an ice business in addition to the farm, and a meat route, an enterprise that ended only with the arrival of Grand Union. When he was farming, the workhorse machine was the McCormick Deering Reaper Binder with which a family could do the work of twenty men. It ruled the fields for a hundred years and only gave way after the war to the combine. An example of this extraordinary machine, as complex and odd looking as any Dadaist invention, is now retired to the farm, gathering moss in slowly changing patterns. A countryside lane breaks from the road, turning off toward a sloping farm field. These meadows are private, cut and tedded and baled in season for centuries. But a new hiking trail will open here on Sept. 27, providing passage around fields of sculpted wood, iron and stone. The Art Farm Trail is already cut and marked. Its pathway laid carefully around hills that framed Crooked Brook ages ago. It weaves a one mile, onelane path through art outcroppings created by Westport artist Ted Cornell, who offers sequel to farm stories and found objects. Walking in hay rows past works of art at Cornell’s farm, only crickets belie the silence his sculptures keep. The soft susurrus of wind sometimes carries the long, drowsy twang of a locust over the meadow. The brook burbles idly in its dry season. Geese trumpet from their late summer flight paths overhead. “For me, I love junk and always have. I remember as a boy finding something in the grass and wondering where it came from and how it got that way,” Cornell said. from a long line of junk. Some 20 sculptures conjure new shapes from a few tons of found farm debris: a McCormick Deering reaperbinder, a grain chute, cart wheels, tractor parts, rubber hoses, old glass, plowshares and stone piles. They are planted strategically on meadow flats around the coiled brook and manmade pond, which was the first installation. The art grows weathered against a mountain fringe of dark forest. The pieces have seasonal queues for entrance and exit, Cornell explains. Sometimes deep snow eases their sharp angles. Rampant swaths of wildflowers draw new horizon lines around them in spring and summer. Sometimes the setting sun paints them in vivid hues of red and blue. Here, an oblique box interprets “Boyhood” with, among its dangling parts, a grain chute, an iron seed box, a blue circle of glass. There, "The Angel of Inerrancy (Conveying WellMeaning Souls to Hell)" raises a halo of hose and metal hands above a glass pitcher. A marble doorknob affixed to its tractor torso offers entrance. “One of the thematic elements of the Art Farm and those statues is respect for the previous culture,” Cornell said. “Many of those rusting objects are remnants that I appreciate as older culture. And it’s a high engineering culture." The sculptures suggest stories of purpose: of the people who left them a hundred or more years ago; of an artist's view; of neighbors and friends who helped install each piece; of those who come to see them. On a meadow flat, the threestory "Memory Tree" points a soaring section of rusted culvert toward the sky. Cornell found it sliced open for some unexplained reason, left to sink in sod and rot. Fraught and fragile with a lace of rust at its seams, he gilded the culvert’s slice in gold leaf. “From here, the pipe provides a vertical opening to space. It recognizes a quantum reality called ‘super position,’ which allows that an object can be in more than one place at a time and still be the same thing,” he said. “The theory goes on to reveal that there are places we can never go — places moving greater than the speed of light, so that we can never catch up,” he said — which isn’t much different than a farmer's Sisyphean task trying to catch up with seasons. Cornell moved here from the city about 25 years ago. In addition to his paintings, sculpture and work in theater, he has since reinvigorated the Wadhams Free Library, incited and founded the Whallonsburg Grange restoration, and spearheaded the Town of Essex Zoning Ordinance. He has served on the boards of the Depot Theatre and the Boquet River Association. He draws from the rich heritage here in conjuring new from the old. “Part of my respect comes from my relationship with Harold Sayre, who farmed around here his whole life," Cornell said. “When I arrived, there he was in his 80s. We spent an enormous amount of time talking and talking. He told me a lot about living on the farm. There was a deep sophistication of its own kind, intellectually and engineeringwise." Among sculptures at the Art Farm sits a gangling, old McCormick Deering reaperbinder in its latest act as art. It was once a machine four or five people could operate, either by horse or by tractor. The reaperbinder could do the work of 20 people, Cornell relayed of Sayre's stories. “It was the main farming tool not lost to us until the combine came in." On this land off Sayre Road, pressed as it is against the acres where Westport, Lewis and Essex town boundaries meet, Cornell fit his painting studio inside the farmhouse around a woodstove. His outdoor work moves between the barn, a tool bench, a pavilion staging area and the fields. He literally digs much of the metal parts he uses from the ground. It sprouts sometimes on its own, pushed up by frost or washed out of mud in the spring flood. Each part presents a piece of the whole story, composing what Cornell believes is a shared event — which is why he approached Champlain Area Trails, based in Westport and known locally as CATS, about adding an Art Farm Trail to their system in eastern Essex County. While many CATS hiking trails protect wildlife connectivity from fields to wilderness, this one interprets farming through a sculptor's eye and handiwork. CATS, Cornell says, with its system of land trust provision and rightsofway on private property, is changing the human concept of connectivity and ownership. It is finding common ground and connecting it. They connect a walk through the Art Farm to a village bakery and cafe. In this way, Cornell says, varied parts of community are clearly strung together as a whole. Rights-of-way cross zoning boundaries, finding an important way to connect rural community, Cornell said. The new Art Farm Trail is about 1.5 miles round trip, according to Gail Testa, operations and development manager at Champlain Area Trails. “The idea of CATS was started in the way of thinking about trail systems in Great Britain. They’ve had permission to walk across people’s properties for generations: it’s just understood," she said. Work on the Art Trail began this summer and was completed by the end of August. Markers with a CATS paw line the route. There is parking near Cornell's barn at the Sayre Road trailhead. From there, the walking path goes through the artwork, over Crooked Brook to the high field and into the woods. "It connects to the Field and Forest Trail, which goes another 2.7 miles right into Wadhams,” Testa said. The Art Farm Trail officially opens on Sept. 27 with two rounds of guided hikes planned that day. WHAT: Art Farm Trail Opening. Guided hikes led by a CATS representative, Tour of Farm and Art will be led by owner and WHAT artist Ted Cornell. WHEN: Sept. 27. Guided hikes at 11:30 a.m. and 1 p.m.; visitors are welcome to hike the trail at anytime during the day. WHERE: The Art Farm Trail, Wadhams, 154 Sayre Road. Read more about Cornell’s Art Farm online at http://www.crookedbrookstudios.com. CATS trail system is mapped online at http://www.champlainareatrails.com. CATS offers a series of interpretive hikes in all seasons. Most include an outdoor education aspect. Oct. 11 — Pond Sprint (13mile run or 4.25mile hike to benefit CATS Long Pond Program. Oct. 11 — Penfield Museum Apple Folk Fest. Oct. 17 — DaCy Meadow Farm Trail Hike & Harvest Lunch (lunch provided by DaCy Meadow Farm). Oct. 24 — Owl Prowl with teacher/naturalist Gregg Van Duessen. Champlain Area Trails is also planning a series of fullmoon hikes this winter, with snowshoeing events and more Owl Prowls. Many trails are accessible in winter by snowshoes or crosscountry skis. One man’s junk is another man’s art. Edward “Ted” Cornell makes sculptures out of found materials at Crooked Brook, his studio in Wadhams, a space that occupies the confluence of art and agriculture. Readers are encouraged to tour his studio on Aug. 29 as part of the Spirit of Place Studio Tour. Sculptures punctuating the vista. Dozens of them, from rusting hulks to piles of household objects that look as if they were deposited by an angry telekinetic with the flick of a wrist. Welcome to the Art Farm at Crooked Brook Studios. It’s a place that exists at the intersection between the two elements of the region’s changing landscape, explained Edward “Ted” Cornell, the farm’s mastermind. Art and farming: the former; a draw to attract visitors to the rebirth of the latter. The first piece to dot the landscape in 2002 was the “Phoenix of Wadhams,” a sculpture assembled, in part, from a neighbor’s old silo and a discarded tractor axle. Some would dismiss it as junk. But rusted junk has an honored place at the farm. Our very sun is a junk star, Cornell noted, made of the debris of its predecessors. The artist’s fascination with technology and life was awakened by his relationship with his neighbor, Harold Sayre, when he first moved to the property in 1989 after his growing distemper with New York City became unavoidable. Sayre, who owned a 600 acre dairy farm, was immediately welcoming and friendly to his arrival, recalled Cornell, who also keeps a firm hand in a theatre world. Sayre assisted him in his transition and the pair spent many long hours in conversation before the farmer passed away. The sculptures glinted in the haze on muggy summer morning as a pair of black cats, Boris and Sasha, danced underfoot and amidst the technicolor flowers — a slice of Aix-en-Provence right here in the Champlain Valley. It’s a place where the items, all of which are constructed from found materials, can provoke intense meditation across a galaxy of concepts — the cosmos, farming history, consumerism, the recession. But it’s not all highbrow. The work is laced with deep undercurrents of sardonic humor — like “Stone Cone One,” an, er, floating conical pile of stones. You’d better go see for yourself. The farm is always open and Cornell encourages visitors to prowl about. The artist noted guests tend to wander the grounds first before seeking out an explanation, eventually looping back to a small structure containing narrative materials. “A lot of people have a powerful experience without a lot of spurning,” said Cornell. Cornell said it’s important for the community, those who he referred to as the “skilled people of this valley,” to be involved in the creative process. He already counts the local workmen who help him locate, transport and plant the exhibits into the soil as active collaborators. “The community feeds it,” he said. The summer has been a busy one for Crooked Brook. Cornell submitted three pieces to the ongoing Spirit of Place exhibition in Westport; he’ll open his studio to the public on Aug. 29 and on Sept. 22, Champlain Area Trails will launch a new trail that’ll take people from the woods and spit them out onto his property. Cornell envisions skiers and snowshoers dropping in to warm their hands over a fire, cupping cups of hot cider in the moonlight. “This is the beginning of a new life for the farm,” said Cornell. Crooked Brook open its doors on Saturday, Aug. 29 from 10 a.m. to 4 p.m. as part of the 2015 Spirit of Place Studio Tour. It seems almost accidental as you drive along on Sayre Road in Wadhams, NY. I crested a hill and found myself facing a rough-yet-elegant steel sculpture poised in a panoramic and rustic Adirondack farmscape. There's an eye-rubbing "what did I just stumble on" moment as you approach Crooked Brook Studios. The sweeping vista of the mountains, and the lines of trees are punctuated by these artifacts that run the spectrum from unadorned and outmoded farm equipment to, well, something else, as if the machinery, put out to pasture, began to think "is this really all there is?" And clearly, it isn't all. The machines, the pieces, the containers, the barns – the very land itself – seems to be caught up in an evolution toward a profound expression. The pieces emerge from landscape rather than intruding on it. There is an easy flow when you walk the farm and observe the industrial textures against this natural landscape. As I walked the low rise from the parking area to the barn, a favorite Cornell sculpture rose into view: "The Angel of Inerrancy Conveying Well-meaning Souls to Hell". It's a large, intricate and powerful piece at sixteen feet long almost fourteen feet high. It was recently featured in Adirondack History Center Museum retrospective of Cornell's work, "Inside the Landscape," occupying the Museum's front lawn for several months. Cornell first began work on "The Angel" back in 2004 with his son Noah, when the two "used their tractor to pull a substantial piece of twelve foot long, three foot diameter piping made of quarter inch sheet iron out of the swamp and then put a bend in its already belabored shape by twisting it around a tree," said Cornell. 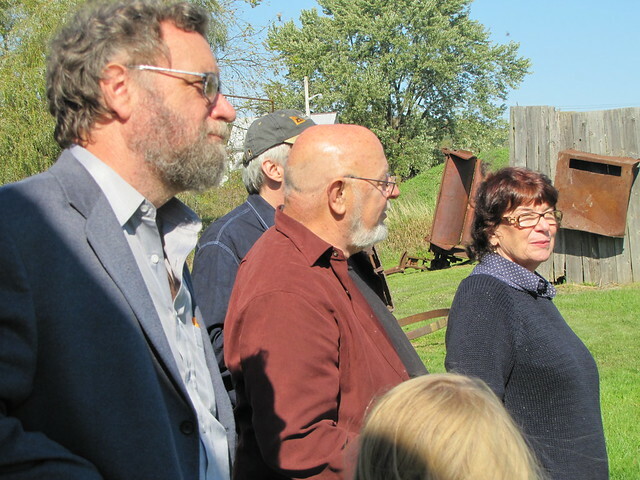 "These awesome sections of unusually heavy pipe found occasionally in our area are remnants of the original power generating turbines of Wadhams that supplied power to the mines in Port Henry," said Cornell. The piece is both of the landscape, but also carves shapes and forms out of it's surroundings, like many of the sculptures on the Art Farm. Cornell said he hopes that the sculpture, in its present location overlooking the pond, "will hopefully encourage visitors to contemplate the long, slow journey of the well-meaning souls." The studio tour was not the only event Columbus Day weekend. The Dragon Press Bookstore in Westport had an event featuring out-of-town writers who all trooped over to visit.